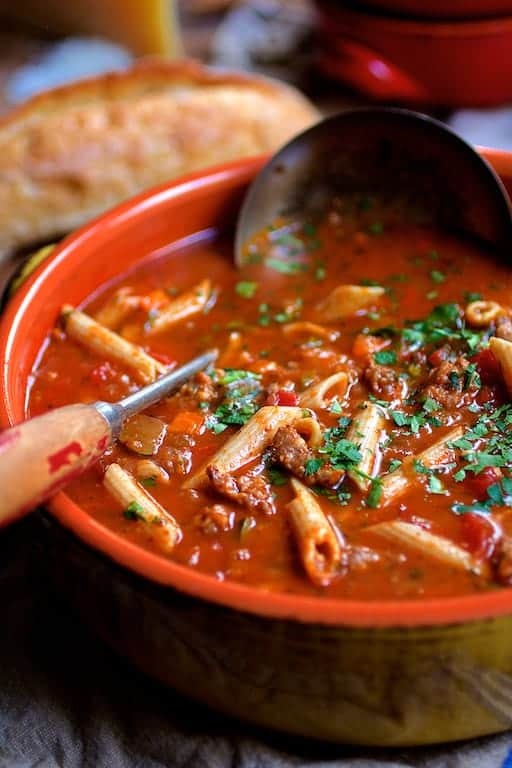 Spicy Italian Sausage, Whole Grain Penne and Vegetable Soup is heaven in a bowl. It’s everything you love about Italian cuisine! 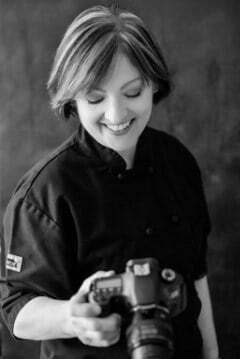 With all the chaos at our home lately because of our “flood,” I haven’t had a ton of energy to do all that much cooking. My husband offered to grill brats, but we had a drawer full of vegetables that needed to get used. Some of the vegetables were ones perfect for grilling: Red and green bell pepper, zucchini and red onion and would have been great on the side with the brats but I was craving pasta. A big bowl of pasta with a hearty red meat and vegetable sauce sounded like heaven! But oh, all those carbs! So, instead decided to transform my craving into a soup with all the elements of a hearty pasta dish but was a little lighter on carbs. My craving was satisfied and soup success with Spicy Italian Sausage, Whole Grain Penne and Vegetable Soup! Soup is absolutely one of my favorite things to make because there’s something truly therapeutic about the process. And honestly, it’s pretty hard to mess up soup (although I have done it!). There’s also something strangely satisfying about being able to clean out an entire vegetable drawer in the process and not have things go to waste or end up in your compost bin. 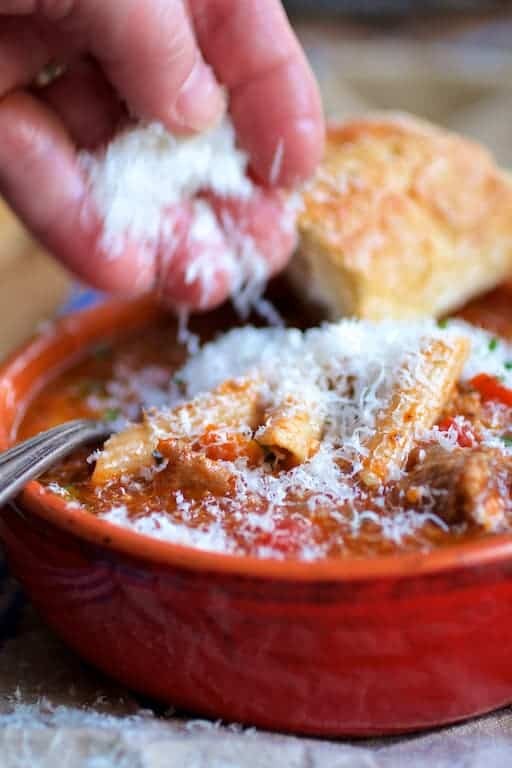 If you cook the pasta right in the soup, the starch produced is going to really thicken your soup. If you prefer to do that, have some extra broth and seasonings on hand. I like to cook the pasta separately and then add it in later. If you have leftovers remaining, the soup is still going to thicken up when refrigerated. I used pork spicy Italian sausage, but if you want to make the soup a touch healthier, use turkey sausage instead. And Parmesan cheese! Can’t forget the Parmesan cheese. Serve some bread on the side if you’re not concerned about carbs. 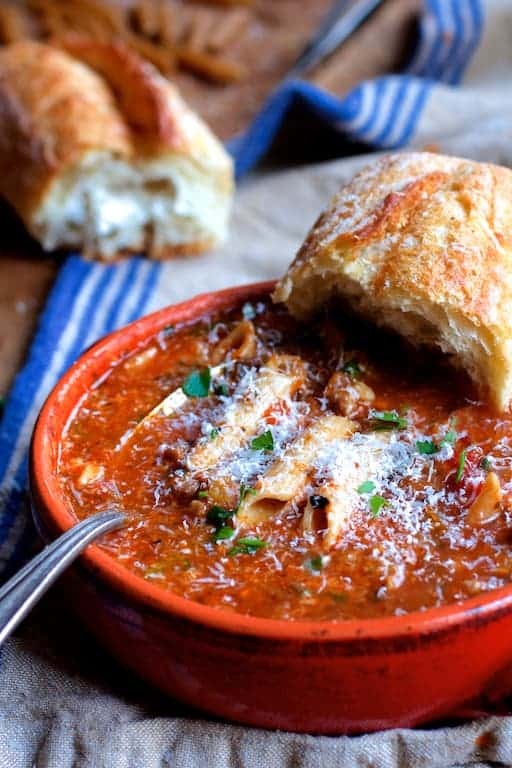 This soup is great for a small gathering or to take to a potluck in a slow cooker! A sure crowdpleaser! 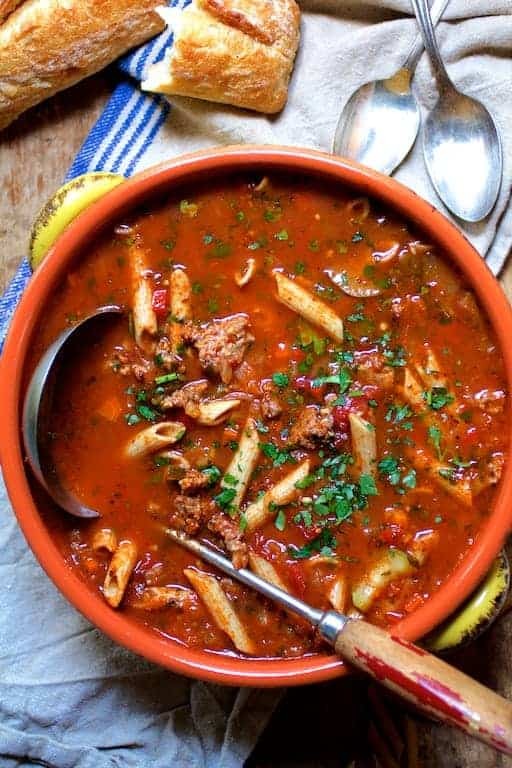 Hearty Italian heaven in a bowl! 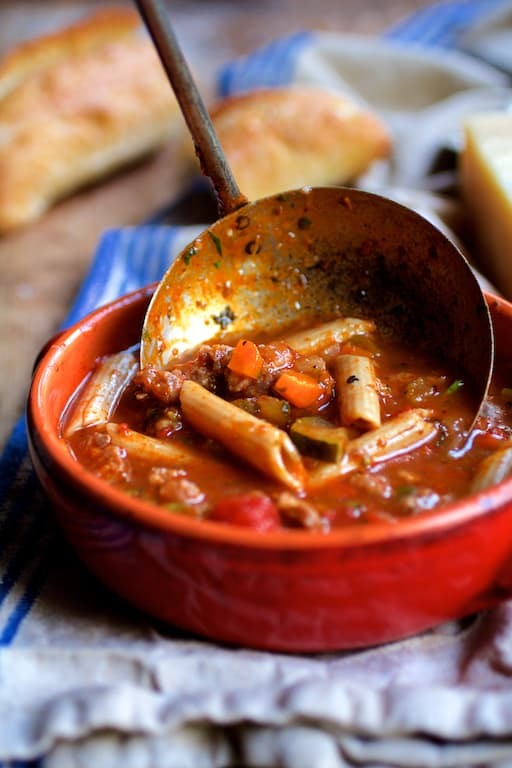 Spicy Italian Sausage, Whole Grain Penne and Vegetable Soup is heaven in a bowl. It's everything you love about Italian cuisine! Cook the pasta according to package directions, drain, rinse with cold water to cool and set aside. Brown the sausage well over medium heat in a skillet or saute pan, breaking it apart as you go, until browned and cooked through. Drain well on a paper towel-lined plate. Set aside. Heat oil in Dutch oven or large soup pot over medium-high heat. Add the onion, carrot and celery. Reduce heat to medium and cook 8-10 minutes or until tender. Add the red, green pepper, zucchini and garlic and continue cooking 4-5 minutes or until vegetables are very tender. Add the dry red wine, chicken broth, tomato sauce, tomatoes, Italian seasoning and crushed red pepper flakes. Transfer cooked sausage back to the pot. Bring to a simmer and cook 15-20 minutes. Stir in the parsley and season to taste with salt and black pepper. Add the cooked pasta to the soup.